This is the third episode of the NEW Image Management Workflow podcast segment. In this new series of podcasts Rick and Juan will talk about managing all your digital photos and videos. In this episode Rick interviews Jeff Cable who is the Director of Marketing for Lexar Media, as we all deal with memory cards for our cameras on a daily basis we thought Jeff could teach us a thing or two about memory cards as well as dispel some long held misconceptions. We also answer some of the questions you have submitted to us. In this episode we also announce our new give-away, thanks to our sponsor Drobo, we will be giving away a Drobo FS to one of our listeners. If you want to enter this giveaway you need to listen to the podcast for the instructions. The deadline to submit your entries is midnight (ET, GMT-5) April 20, 2011. 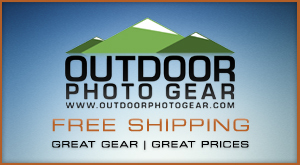 We announce the winner on the next Image Management Workflow podcast on or around April 26, 2011. This new Image Management Workflow podcast is brought to you by Drobo. 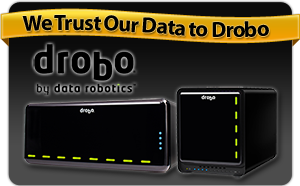 Drobo makes the best storage units to safely and securely store all you digital assets. Both Rick and Juan trust Drobo to store all of their digital images! This is Episode number 3 of the Image Management Workflow Podcast with Rick Sammon & Juan Pons. 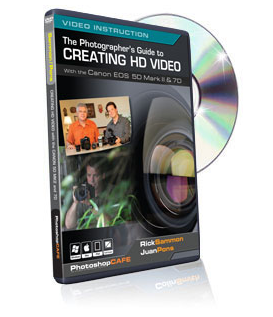 Click on this video screenshot to view the video Juan made to for the B&H presentation. Thanks for two great podcasts. They are both useful and entertaining. I wanted to comment on the recent description of how Rick manages the SD Cards from the camera bag to/from the camera and finally to the computer. While flipping them backwards does give you a good visual clue that they contain pictures, there is always the accidental drop/shuffle of the cards. For example, if half of your cards have data on them and in the process of replacing the next card the entire bag falls, or you get bumped, the cards may fall out and scatter. My point is that the flipping is not enough. SD Cards have a slider button on the side to “Lock” the contents from being edited. This is very similar to the slider on the [now defunct] 3 1/5 inch floppy disk which locks them and prevents the editing or deletion of the contents. Please add this one small step to your process, and you’ll have the assurance that the Locked cards are the ones that have your photos/videos on them, and the ones that are unlocked are available to use. To complete the workflow [since this is the ‘Image Management Workflow Podcast’] you can ‘Un-Lock’ the cards after you’ve copied the content on your computer and just prior to inserting them in your camera with the intent of formatting them. Thanks again for your hard you both put into your craft and into the podcasts. Thanks for the feedback and the suggestion. Great idea for those that use SD cards! I understand why you use the two Drobo system. Do you use Time Machine to backup to one of the Drobos? What is advantage of backing up to a Drobo unit rather than a separate external Harddrive? This Podcast is great, but causes me to get lots of new toys. I use a program called “Synk” to back up my main drobo to my secondary drobo. I do not like to use TM because I have almost no control over it. The reason to backup to a drobo vs an external drive are the same reasons as to why you get a drobo, data security, and easy to expand capacity.